Our Exodus Travels Jordan Tour started with our arrival in Amman. The Exodus rep assisted us through immigration. Amman was completely different than Dubai – no more English, no more US dollars, no more modern architecture. In the morning we met our tour group. There were 10 people from Britain joining the two of us from Canada. 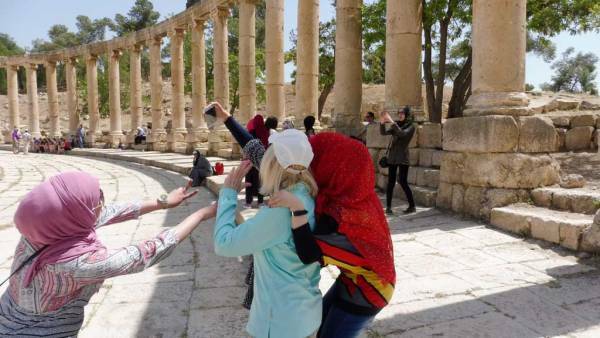 Our guide indicated that since the Arab Spring revolts, tourism in Jordan was down 90%. They used to run 5 buses for this tour, but now they were only running one half empty bus. 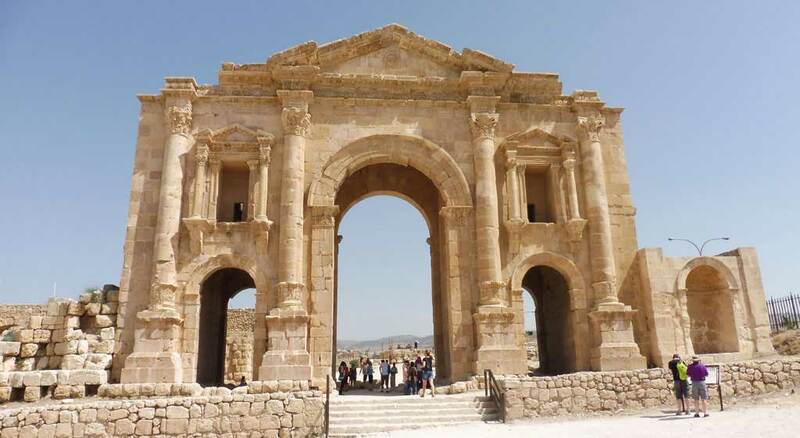 On our first tour day, we visited the ancient Roman ruins of Jerash. 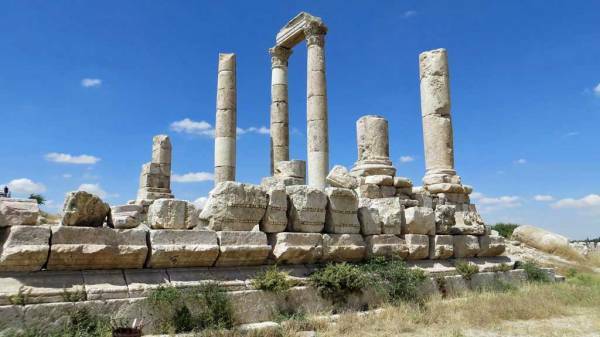 The ruins are about an hour north of Amman and less than 20 miles from the Syrian border. There were no concerns about our safety at the site. The ruins cover a couple hundred acres. We entered through Hadrian’s Gate and then wandered through the Hippodrome. Next we passed through the South Gate to the Oval Plaza. At the Temple of Artemis, we put small twigs in the cracks between column sections, because the twigs then move up and down with the sway of the column. They do this because there is lead in the seams. This has helped the building survive earthquakes over the centuries. We also visited two amphitheaters and strolled the Colonnaded Street. Syrian Girls taking selfies with a Canadian blonde. A highlight of the visit was when a group of young female teenagers approached my wife for pictures. They were Syrian refugees living in Jordan. These teenagers wanted pictures with my wife, because they were enthralled with her blonde hair. They wanted to know what Canada was like, as they were hoping to immigrate there soon. 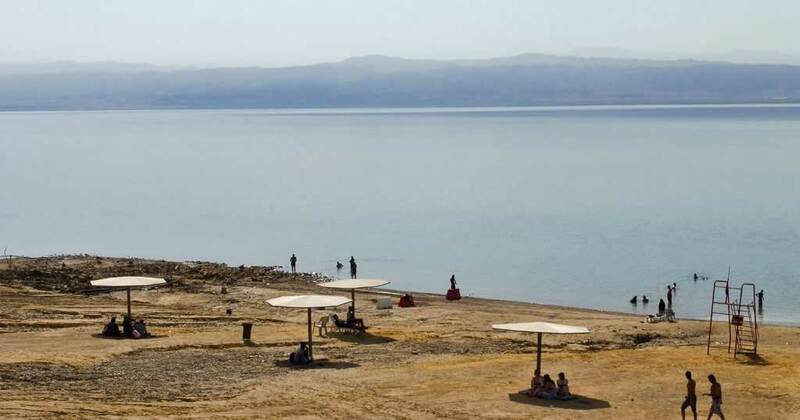 On the second day headed to the Dead Sea for the obligatory swim in the salty waters. You can’t stay in the water too long, as the chemical content eats at your skin. The buoyancy of the water is hard to describe. When I swam face down, I had to fight hard to resist being flipped on my back. It was like wearing a life preserver. The Dead Sea is continually reducing its volume as water sources like the River Jordan are being depleted. We saw clear signs of the retreat of the shore line. On Day 3 we repositioned from Amman to Petra with several stops along the way. The route is historically known as the King’s Highway, but it’s a slow and often poorly paved route. We visited Mount Nebo, where Moses first saw the promised land. Then we stopped in Madaba to see the ancient map of Jerusalem in the mosaic floor of St George’s Orthodox Church. We also stopped at Kerak Castle. Kerak is an Arab fortress that was taken over for a short period by the Crusaders. 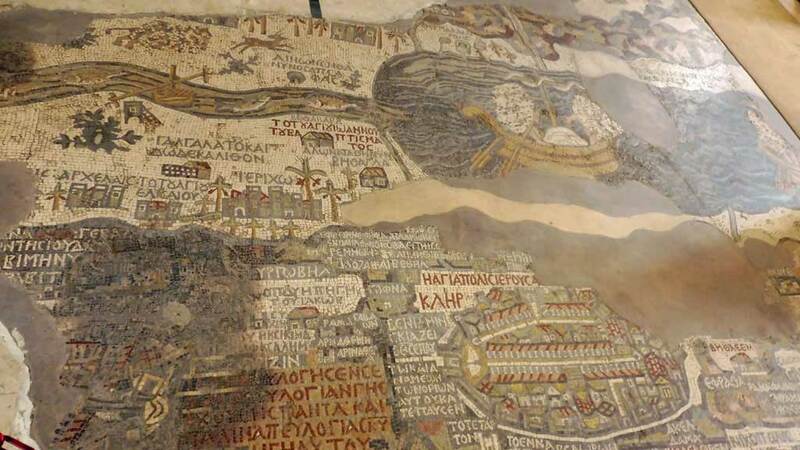 Although we felt completely safe in Jordan, it was only 8 months after our visit that terrorists killed 10 people at Kerak, including one tourist. 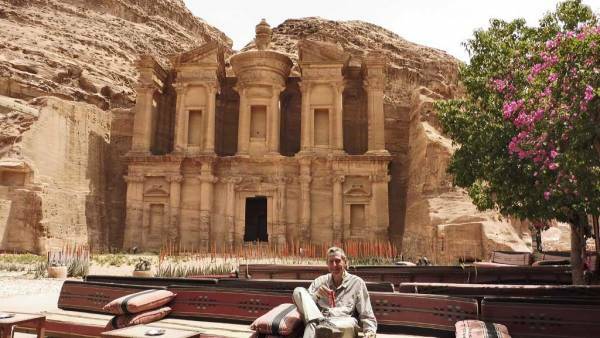 We arrived at Petra that evening for a 3 night stay at the Petra Palace Hotel in Wadi Musa. The hotel was affordable and convenient. 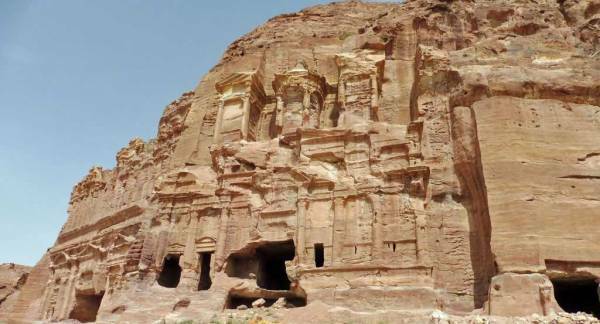 Plus, the best part is its location a few feet from the walk in entrance gate to Petra. There was an evening light show at the Treasury, so we paid the fee and walked in the dark down the narrow canyon of the Siq to the Treasury. The path is very uneven and cobbled in places, which makes walking quite challenging in the dark. Still it was exciting. At the Treasury, tourists sat on the ground among small candles. Colored lights were projected on the Treasury, while traditional bedouin music was played on a single stringed instrument called a rebab. I can’t say I’d recommend the light show at the Treasury, but the anticipation was worthwhile. The next morning we were the first people to take the 20 minute walk down the Siq that day. The Siq was amazing in the light of day. The original irrigation lines through the canyon are visible and there are faded sculptures of caravans on the walls. The canyon narrows even more just before the Treasury, making for a dramatic arrival. From there we headed down past the Roman amphitheater and the Street of Facades. 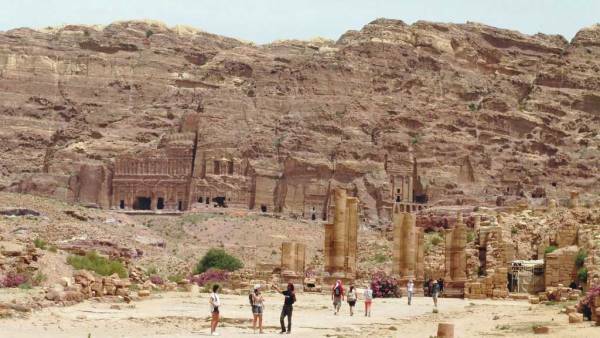 Although it was early May, the temperature was already hot by the time we visited the Great Temple and the Qasr el-Bint. Next we climbed out of the valley floor for about 40 minutes to reach the Monastery. Bedouin’s are allowed to sell goods in Petra, so candy bars, chips, tea and souvenirs are readily available. The Bedouin’s are famous for their honesty. They even offered to sell goods on a promise to pay later when we came back down from the Monastery. After the monastery we visited the Urn Tombs, the Palace and the Corinthian Tomb facing the Great Temple. On the way out, I was tired enough that I negotiated a deal on a camel ride back to the Treasury. 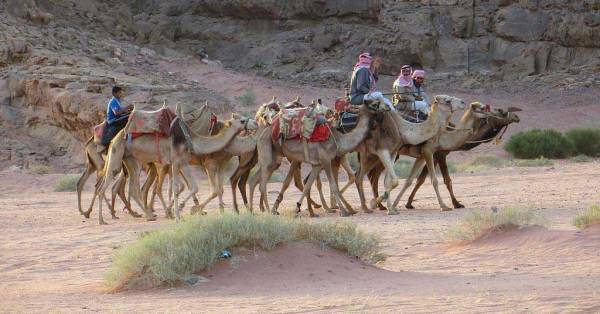 They wanted to sell another ride to my fellow travelers, but when I quoted my discounted price, the camel owner said that anyone else in my group would have to pay full price. Very funny. On our second full day, we started by climbing onto the peaks above the Siq instead of walking through it. After over an hour, we reached the High Place of Sacrifice. There were views of Aaron’s Tomb in the distance. Even on the mountain tops, bedouin vendors were selling tea and snacks. From there, we then descended to the valley floor at the Street of Facades. A friend and I stopped on the way down to gaze over the scene below. 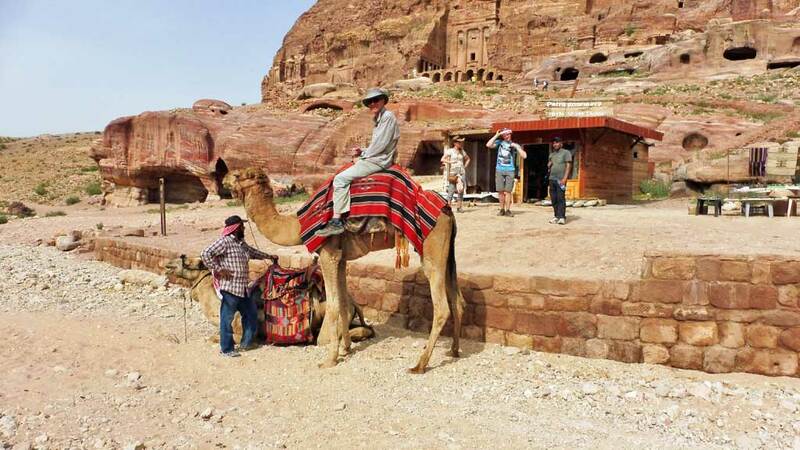 There was a bustling crowd of tourists, vendors and camels. It seemed like we were looking at a civilization from centuries earlier that was going about their day. This was the highlight of my visit to Petra. After Petra, we made our way to Wadi Rum. 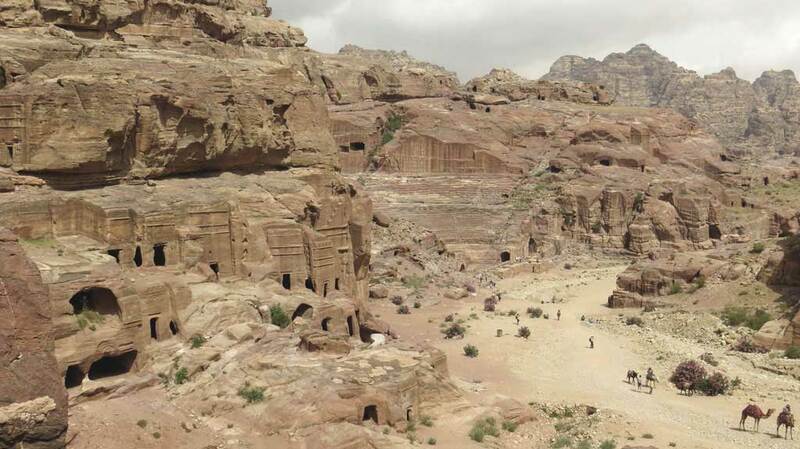 Lawrence of Arabia made this area famous. We camped out under the stars on the desert sands. I got lots of little flea bites that night. Not my favorite stop. From Wadi Rum, we drove to Aqaba and stayed at the Marina Plaza Hotel. This was a vacation spot with beach access and quality restaurants, which made a strong contrast with the rest of our tour. I enjoyed good snorkeling right off the beach at the hotel. The next day we made the long journey back to Amman on the main highway. Jordan has no oil reserves, so this route is very busy with truck transporting oil and other goods from Aqaba to Amman. In the late afternoon we still had time to visit the Roman amphitheater in Amman and the Amman Citadel with its Roman and Byzantine ruins. The next morning we flew back home to North America. 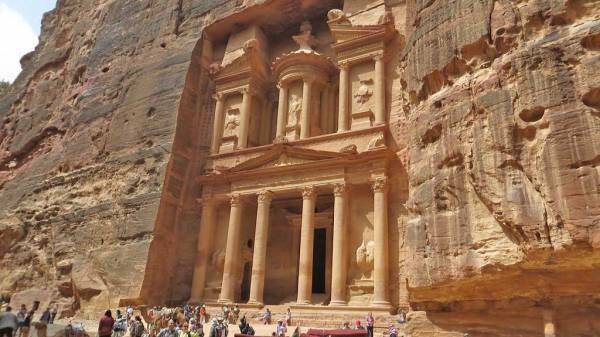 Jordan was an amazing experience and I felt lucky that we were able to see it.